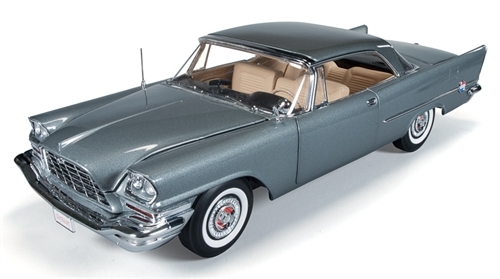 The Popular Mechanics™ 1957 Chrysler 300C may have been the 3rd of the iconic 1950’s “muscle luxury” cars from Chrysler, but it was one which captured the imagination of the buying public. With a 392 horsepower HEMI® engine this vehicle was once referred to as “America’s highest-performing automobile”. Prior to being introduced to the general public the 300C beat the unofficial stock car record at the Chelsea Proving Grounds, averaging 145.7 mph on the oval; it later won the Flying Mile at Daytona with a top speed of 134 mph. This Hardtop model as featured in Popular Mechanics™ evokes memories of powerful and stylish muscle cars as adept at track racing as they were on the street. The image is completed with tan interior seats, white wall tires, and displayed in the stylish gunmetal gray, a rare special order color.